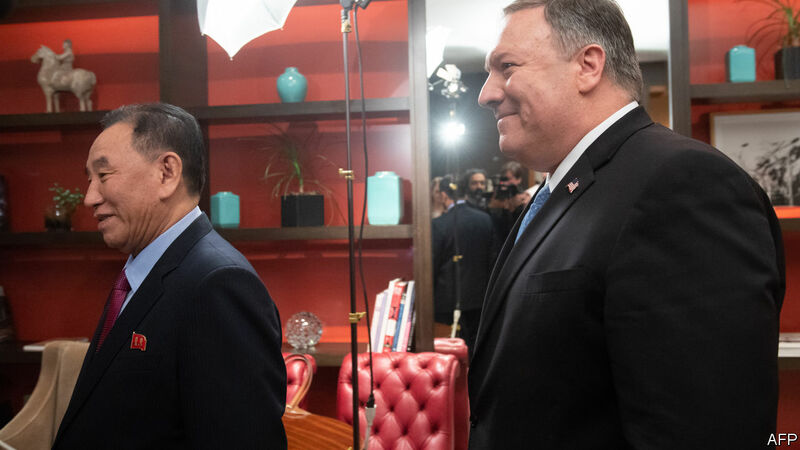 THE SECOND visit to the Oval Office by Kim Yong Chol (pictured, left), North Korea’s chief nuclear negotiator, was decidedly more low-key than the first—if the size of the envelope he brandished was anything to judge by. In June last year Mr Kim brought President Donald Trump a giant letter from Kim Jong Un, the North’s dictator. In response Mr Trump agreed to meet “Chairman Kim” in Singapore a few days later. But apparently size is not everything when it comes to envelopes. Shortly after Mr Kim had waved goodbye to Mr Trump and retired for lunch at his hotel with Mike Pompeo (pictured, right), America’s secretary of state, the White House said that there would be another summit between the two leaders in late February, at a location yet to be specified (though logistical preparations are reportedly underway in Vietnam). The announcement suggests that both America and North Korea are keen to break the impasse that has plagued their nuclear negotiations since shortly after the summit in Singapore last June. At that meeting, Mr Trump and Mr Kim had agreed to improve relations between their countries and work towards the “complete denuclearisation” of the Korean peninsula. But there has been little movement towards ending the North’s nuclear programme since then. Negotiators have been unable to agree on the sequencing of concessions by the two parties or to make a start on the technical details of a disarmament deal. Reports from American spy agencies and analysis of satellite imagery by arms-control researchers suggest that the North’s programme has continued to expand. The Pentagon continues to regard North Korea as an “extraordinary threat”. There is a chance that the second summit and the meetings that are planned in the run-up may restore momentum to the diplomatic effort. Stephen Biegun, the special representative whom Mr Trump appointed last year to handle negotiations with North Korea, looks set to hold talks with Choe Son Hui, his North Korean counterpart, over the coming days—for the first time since he took the job in August. That may be a start to the detailed working-level conversations many observers say must supplement the high-level summitry to hammer out a deal. So far, neither side has released any details of the conditions for the second summit. America insists that the North needs to take concrete steps towards dismantling its nuclear programme before receiving the sanctions relief and “security guarantees” (which may include a partial drawdown of American troops stationed in South Korea) that it says it wants. That the summit is now on the cards suggests the North may have offered something. Possibilities include the dismantlement of its ICBM programme, which would suit Mr Trump’s goal to remove the nuclear threat to the American mainland, or permanently decommissioning the nuclear site at Yongbyon and allowing international inspectors to verify its closure. In return, America may offer support for partial or temporary sanctions relief, possibly tailored to allow economic co-operation between the two Koreas. Such an outcome would certainly be welcomed in Seoul. A spokesman for Moon Jae-in, South Korea’s president, applauded America’s announcement over the weekend, saying that it represented a “turning point” for building a permanent peace on the Korean peninsula. Inter-Korean rapprochement, which had progressed even as the nuclear talks between America and North Korea had stalled, cannot go beyond today’s symbolic level without at least a partial lifting of sanctions. If the second summit is a success, South Korea may be able to reopen the Kaesong industrial complex and the tourist resort at Mount Kumgang, or begin to invest in refurbishing the North’s railways, which the two Koreas have been jointly inspecting since late November. As with the summit in Singapore, however, the short time allotted for the preparation of the meeting carries risks. The vaguely worded declaration the two leaders signed in Singapore bears at least some of the blame for the lack of progress since then, because it lent itself to protracted arguments over definitions, which North Korea has used successfully to stall on steps towards nuclear dismantlement. And given Mr Trump’s avowed dislike of America’s global military presence, sceptics fear that he may be talked into lifting sanctions and reducing troop strength on the Korean peninsula in return for an end to the North’s ICBM programme, leaving Japan and South Korea to contend with a de facto nuclear state.